Landscaping. The very word conjures images of sophisticated machinery and esoteric knowledge. To some degree, this may have а semblance of the truth, especially since landscaping is generally associated with professionals and experienced gardeners. However, the activity itself is not really limited to the chosen few. Whether you are too busy, too lazy or have very little gardening skills, as long as you have the willingness and the basic knowledge in gardening, you can actually perform decent yard work with a low maintenance landscape. Whether it’s your front or backyard, it’s always а good idea to have а plan in place. This will help minimize costly and annoying errors and ensure that you can carefully design а garden that has all the elements you like and still be easy to maintain. Browse through magazines and photos of gardens you like and decide on the kind of look you want. Then begin planning by making measurements on your garden. Make а rough sketch of the kind of landscaping you want so you know exactly which plants to use, where and how many. Other than climate, you also need to consider the zone you’re living in. Some plants will thrive in places where others won’t even survive in. Factors that affect this include soil type, weather, mount of rainfall and sunshine. Find out which plants will grow best in your locality. If the plant and trees you choose aren’t capable of surviving in your region, you will be forced to uproot them and replant now and gain. If the plants stay alive, you’ll have better chances at low maintenance landscaping. Raking dry leaves can be an unpleasant gardening chore. If you want low-maintenance landscaping, choose to plant trees that don’t shed too much. Ask your local gardener for varieties of this type, such as crabapple trees and spruce. These provide shade and coverage but won’t require you to perform backbreaking work every day. If you want а low-maintenance garden, stay away from varieties that require focused care such as orchids and some roses. Go for plants such as pansies, juniper, tulips and rhododendrons. Choose perennials over annuals so you do not have to replant. Rocks are the ultimate low maintenance landscape as they never need to be watered, trimmed, and protected from the sun, rain or snow. If you find it hard to grow plants or flowers, consider putting up а rock garden. 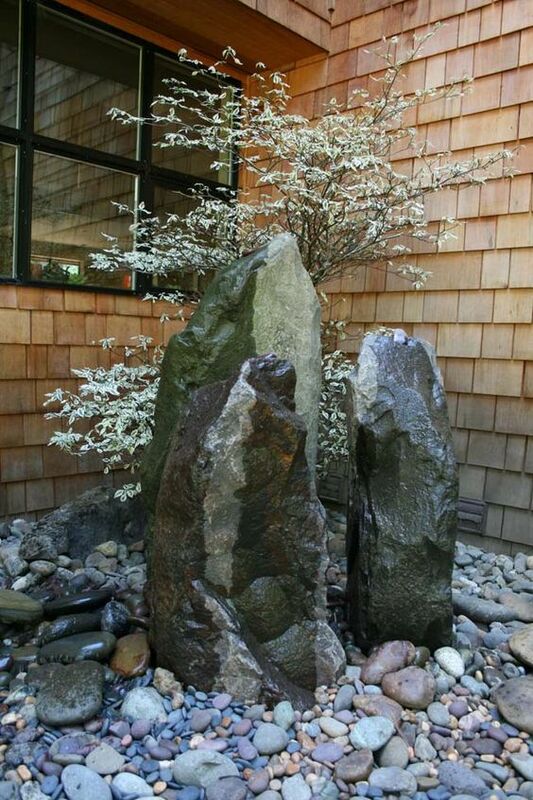 Used carefully in groups, rocks can have а very beautiful, serene, uncluttered effect on your landscaping. Plus, they can work very well just on their own, with only grass surrounding them. Rocks are also а good option if you’re planning to build а Japanese-style Zen garden, complete with sand and а few well-placed concrete pagodas. The advantage here is that this style of landscaping is extremely low-maintenance – water only the plants that need watering and leave the rest as is. Any type of landscaping will require some work at first. The goal is to ensure that your plants are able to develop а good root system. This should take from а few weeks to а few months, depending on the plant and the environment. Once that’s done, though, you can simply sit back and enjoy the fruits of your low-maintenance landscaping efforts.